Sequoia-backed Bubble Motion recently launched a Twitter-like voice blogging service and has seen considerable traction in India, where politicians, brands and actor are using Bubbly to connect with fans. 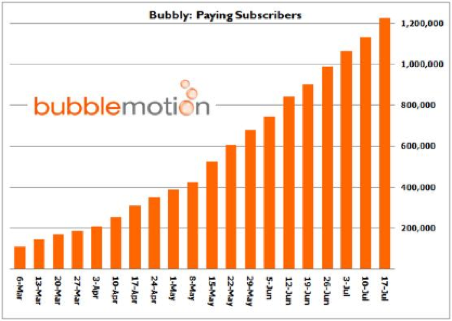 Rolled out just months ago, Bubble Motion’s voice-blogging phone service, called Bubbly, has accumulated more than 2 million overall users and currently has over 1.2 million paid subscribers across multiple telecom operators in India. And Bubble Motion is adding 100,000 new paid users per week. Bubbly is configured like a voice-based Twitter, using SMS alerts and dial-in codes to record and receive voice updates on mobile devices. When a users records audio messages and updates, followers can listen in whenever they want. To start voice-blogging, you enter a short code onto your phone, and start recording your messages. To follow another voice-blogger, users dial the phone number for whomever they want to follow. Whenever there’s a new audio update, followers are notified via SMS with instructions on how to listen. Deployed through partnerships with mobile operators, Bubbly is an extension of BubbleTalk, a click, talk, and send’ messaging service that doesn’t require any calling. Bubble Motion claims that Bubbly is already bigger than Twitter in India for participating celebrities. Bollywood actor Amitabh Bachchan, for example, has more than 350,000 followers to his Bubbly voice-blog, compared to 250,000 on Twitter. Bubble users actually pay 30 rupees ($0.65 USD) per month to be notified in real time of voice-blog updates per celebrity they are following. It’s not surprising to see a SMS-based microblogging service gain traction in India mobile phone usage exceeds internet usage. Competitor SMS GupShup has also seen rapid growth in this market. Bubble Motion is also working on launches of Bubbly in Indonesia, Philippines, Malaysia and Japan for later this year. Bubble Motion, which is based in Mountain View, Calif., has raised a total of $35 million in funding since the company’s launch in 2003.